The 2014 edition of the “Aspen Leadership Awards and Gala Dinner”, on December 3, celebrates our achievements in the past 8 years and offeres a perspective on our future leadership, policy and public programs. The Aspen Leadership Gala stands as an occasion for those that were instrumental in our creation and successes and those that benefited of our programs and fellowships, to once again come together and reflect on what is the added value of a community moved by shared values and not just interests. 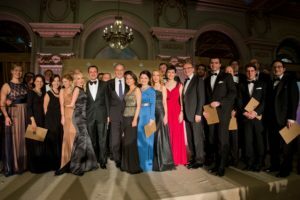 The Gala honors the Young Leaders Program 2014 generation for its accomplishments in the past year in the ambitious attempt of producing a significant impact on societies across Central and Eastern Europe. Rică Georgescu, after whom the award is nominated, was former director of Standard Oil in Romania. He was among the few that resisted collaborating with the Nazi Germany during the years Romania was allied with the Nazi regime or occupied by the German Army. After the war he left Romania in 1947 to the United States and was forced to stay there due to the political changes in his country. Not accepting to collaborate with the Communist Secret Service in exchange for the wellbeing of his sons who remained in Romania, Mr. Georgescu offered a model of high moral grounds, courage and perseverance. His relationship with Frank Wisner, then head of OSS, has eventually helped him get reunited with his family. This award is offered in the memory of George Pomutz who was a Brevet Brigadier General in the United States Army and later a career American diplomat of Romanian descent. His sense of duty, diplomatic abilities and moral high ground made him one of most respected individuals by his peers. After the conclusion of the American Civil War, in May 1865, he had the honor of parading alongside President Andrew Jackson on Washington’s Pennsylvania Avenue. In 1866, he was named Consul General of the United States to Saint Petersburg, where he participated in the negotiations for the purchase of Alaska. The “Contribution to Romanian Cultural Patrimony” Leadership Award is presented to an individual who through his/her actions has significantly contributed to the enrichment of Romanian culture, promoted Romania abroad and supported the overall development of the country’s cultural patrimony. Aspen Institute Romania, through its cultural activities and involvement, believes that the moral and cultural fabric of nations is essential in achieving the Good Society. Therefore, we encourage you all to support the Romanian cultural heritage as well as the young representatives of all arts in their endeavors. The “Sports and Society Leadership” Award is presented to an individual who has transformed sports into more than a physical activity. As the great Nelson Mandela put it “sport has the power to inspire, to unite people and it speaks to youth in a language they understand. Sport can create hope where once there was only despair”. We believe that the recipient of this award inspires and offers a model of commitment, dedication and professionalism. The “Innovation and Technology Leadership” award is presented to a leaders or an organization which brought significant contributions to the Romanian innovation, research or entrepreneurial environment.